While the number of food concepts are possibly endless, the physical looks of food trucks are remarkably similar. Your typical food truck might be typically boxy, with a front fascia reminiscent of the food truck. But as cars become more fuel efficient and as cooking technologies continue to get more advanced, it’s time to take a look at what might be in the food truck of the future. 1. They’ll likely be very energy-efficient. When the truck company Peterbilt showed off an 18-wheeler concept that can go almost 11mpg (double today’s semis), it was considered a monumental way forward for large vehicles like trailers. By potentially using similar methods from Peterbilt and taking advantage of state-of-the-art energy systems (like the one from the advanced engineering division of the Williams Formula One team), food truck owners have an advantage of saving serious money from fuel costs alone each year. Additionally, we’ll also likely see more modern-looking food trucks as well. No, it won’t have a lot of bling or anything like that. But as companies like FedEx are already employing modern design on their next-generation trucks, food trucks can not only save more money on fuel, but also get more attention for rad looks as well. 2. They’ll probably have modular design. Much as how modular buildings allow easy expansion to existing buildings, adding modular design to food trucks would be more likely for a number of reasons. One reason is it allows flexibility. Not everybody uses the same truck to sell their food. Some people might use something as simple as a towing trailer, or something as large as a fire truck. By incorporating modular design, the future food truck owner can adapt his/her concept to many different situations. As food truck parking rules start to become more stringent, the future food truck owner would relish from having to just snap/hook on or off components to make the food truck shorter or longer. Another potential reason is for time. Usually when building out a food truck, it’s an intensely long, but a la carte process. But if you just want to open one and soon, having a modular food truck might be the way to go. 3. Food Trucks might face more regulation. An article from the Phoenix New Times provides a snapshot of how the future of food trucks might look like. Chief among them? Regulation issues. For pretty much most cases, food truck regulation is usually a city-by-city issue (Orlando passed food truck regulation on 2013, for example), with the exception of California where it’s regulated on a state level. As more food truck associations pop up, not to mention one that’s national-level, the continuing rise of food trucks might provide the way for more regulation. What regulations would that include is not completely certain. 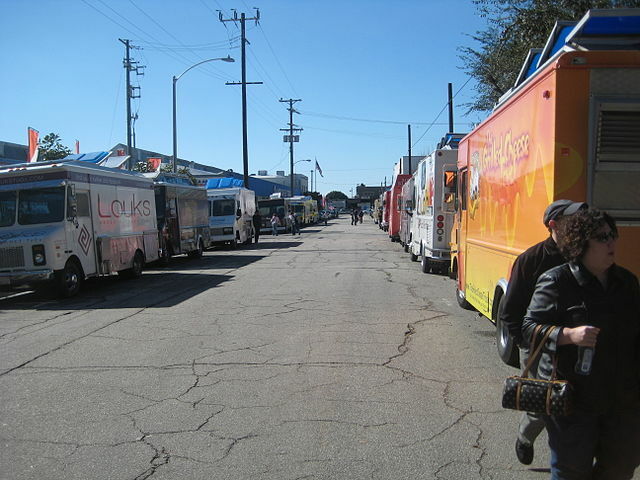 Usually food truck owners must tackle licensing and parking/zoning issues before anything else. But as California allows sales-tax additions to menus, and as Washington D.C. deploy dedicated parking zones for food trucks–the future, at best, is uncertain. 4. Food Trucks might be the next thing in franchising. This is not an easy topic to talk about, pretty much because this is a discussion that’s just on the corner, but there’s a distinct possibility that people who want to start a food-service franchise might result in a food truck. As TGI Friday’s get into the food truck game, along with interest from food truck companies themselves, the future franchise owner might be able to think five figures rather than six- or seven-figures. But as regulation becomes more and more on the forefront, it might be a while before franchising your own Kogi in Orlando is even an option.